Prime Minister the Most Hon. 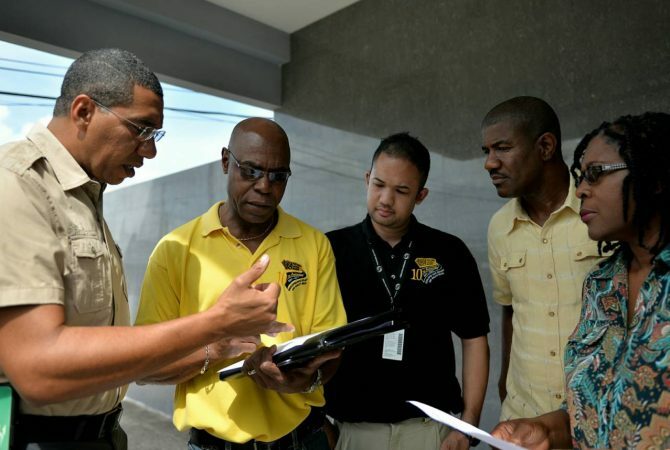 Andrew Holness (left), is being briefed by Chief Executive Officer, National Works Agency (NWA), E. G Hunter (2nd left) on his arrival at the NWA's Maxfield Park offices in Kingston today (Oct.1) to get a firsthand look at the agency's planning and operations centre. Others (from 3rd left) are: Chairman, NWA, Parris Lyew-Ayee; Director of Regional Implementation and Special Projects, NWA, Varden Downer; and Permanent Secretary in the Office of the Prime Minister, Audrey Sewell. Jamaicans living in low lying and flood prone communities are being urged to heed any evacuation warnings issued for Hurricane Matthew. Matthew, which is now a category four hurricane, is expected to impact the island as early as Sunday (October 2). 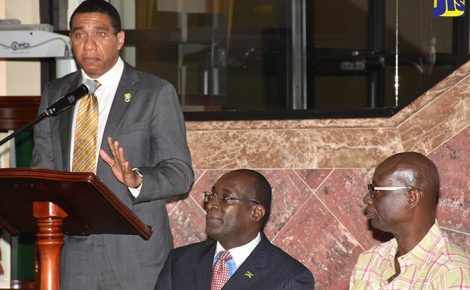 The Prime Minister urged citizens to take all necessary precautions in preparation for the hurricane, noting that this will reduce loss of life and damage to property. The appeal came from Prime Minister the Most Hon. Andrew Holness during an interview with journalists following a tour of the planning and operational centre at the National Works Agency (NWA) in Kingston today (Oct.1). 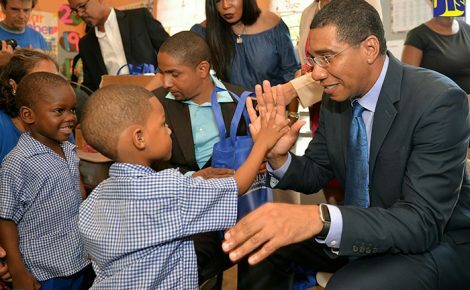 “I am encouraging all Jamaicans to pay close attention to the warnings that will be given either from the police, the Office of Disaster Preparedness and Emergency Management (ODPEM), the NWA or generally from the Government; they are all in your best interest,” he said. He said that although no official evacuation warning has been issued so far, Jamaicans should take personal responsibility to protect themselves and their families and relocate to shelters or the homes of relatives. “There are areas, which traditionally flood whenever there is a hurricane, even of lower magnitude than this and those areas are well known. The projected path of the storm will definitely affect the eastern and central parishes of Jamaica so the low lying areas, places like Manchoneal in Portland, will definitely have serious potential for flooding and other forms of dislocation,” he noted. He said voluntary evacuation will also allow emergency personnel to focus their resources on other areas. “Jamaicans are taking this threat very seriously and the message is be prepared. 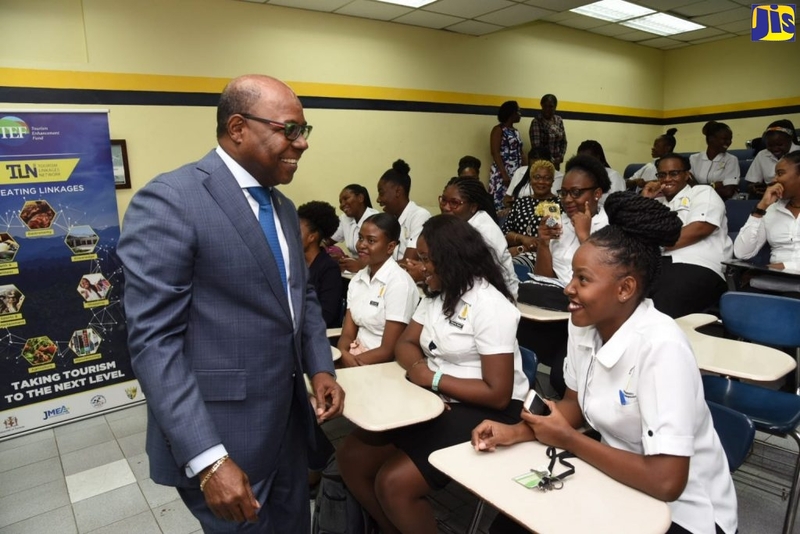 I think 90 per cent of Jamaicans are at the point where they are taking it seriously and making their preparations, certainly, within the resource constraints,” he said. He informed that shelters have been activated and will be adequately equipped. 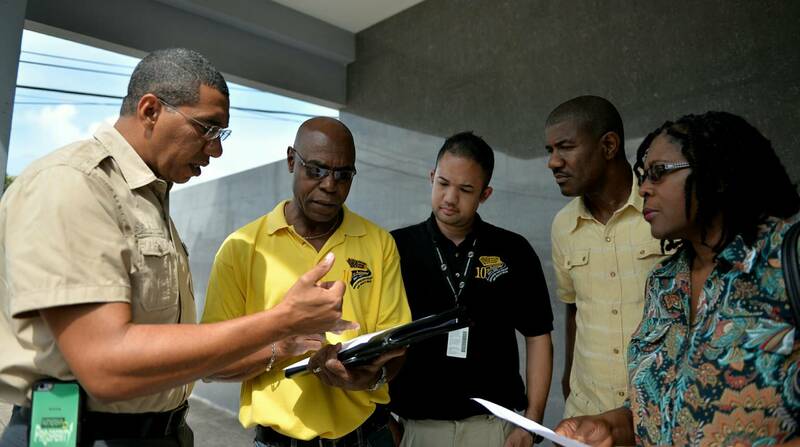 Mr. Holness urged members of the public to communicate with the ODPEM regarding shelters that are not up and running. In the meantime, Mr. Holness said the relevant government agencies have been mobilised to undertake preparatory and recovery work. “The more prepared the Government agencies are, the faster the recovery process will be,” he noted. The Prime Minister said he is “very satisfied” with the systems in place at the NWA to gather information and direct resources. “They have assured me that they have prepositioned equipment and manpower just in case of any eventualities,” he noted. He informed that the Government has put plans in place to ensure that relief needs are coordinated efficiently, and that international aid is handled in a transparent manner. He noted as well that he has been in contact with regional leaders. 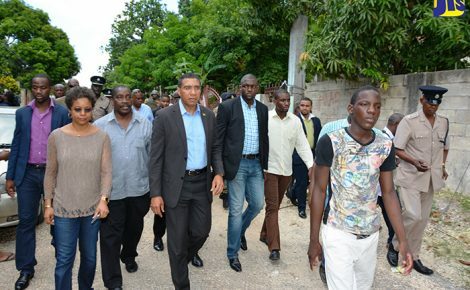 The Prime Minister also toured the Tinson Pen, Shoemaker and Tivoli gullies in Kingston, and Nine Miles and Harbour View, St. Andrew to get a firsthand look at the preparatory work being done for the impending hurricane. A hurricane warning has been issued for Jamaica.